That time of year is fast approaching once again, holiday season - where the waves call your name, the sand glistens while luring you to the water, and various stunning locations around Australia are just begging for you to pack your bags and visit them. Summer is the perfect time of year to take a trip and experience the wonders that a self-drive holiday can provide! For those nomads new to campervanning or those seasoned campervanners that have recently purchased a new or different size camper, our expert team at KEA thought we’d go back to basics and share our top tips that you’ll need to know, to drive your campervan safely on your next big adventure! Our list of safety tips will ensure your time on the road is a pleasant one. Before you start driving, make sure your wing mirrors are correctly adjusted as you’ll be using them frequently. Not having a central rear-view mirror can be a shock but you’ll soon get used to it; after all, modern campervan mirrors provide excellent visibility! Also make sure you understand what you can (and can’t) see in your mirrors and where any blind spots may be. To prevent any unexpected hiccups, make sure you check your tyres for tread depth and pressure before starting out on any trip. Check them regularly and keep them inflated to recommended pressures. The recommended tyre pressure should be on the side of the tyre or in the owner’s manual. Should the unthinkable happen and you do get a flat tyre, find a safe spot to pull over, turn on your hazard lights, and then call a professional who can help you safely change the tyre. a good idea to map out your route first, making yourself aware of the nearest petrol stations, convenience stores and emergency help locations should you run out of any supplies along the way. While you’re checking these points, make sure to check your oil, just in case your van gets thirsty. Lastly, ensure that you know what type of fuel your campervan takes before you leave for your adventure. Keeping your van filled with a healthy stock of quality fuel is the best way to start your holiday on a good note! When you first set out on your adventure, try sticking to the left lane on motorways and highways, unless you need to overtake another vehicle. Also allow yourself some time to get used to the different driving conditions experienced in a campervan compared to a car. In no time you’ll be driving the camper like a pro, but take it easy to begin with! Taking a corner in a campervan is quite different than in a car, and requires a little more care. Slow down well in advance of corners and brake a lot earlier and more gently than you might in a car. Also aim to finish braking before you enter the corner and use the accelerator to maintain a constant speed through the turn. If you have an extra passenger along for the ride, get them to help you out and be your guide. Ensure you both have the same understanding of which signals you’ll be using and what you each mean by them. This understanding can mean the difference between a pleasant holiday, or days of silent scowls and monosyllabic conversations. While reversing, don’t turn the wheel unless you’re clear of all obstacles, and allow plenty of space. Spatial awareness will be your best friend while you’re getting used to your van, so get out and take a look around. Pay close attention to the length, width and height of your van, as well as the space around it before reversing. Campervans are fantastic for tailoring your road trip and creating the adventure of your dreams. 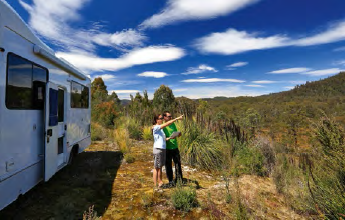 Now that you know what to expect, make the most of the holiday season, get out there and explore the stunning regions on offer with your KEA campervan!